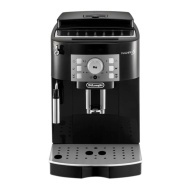 alaTest has collected and analyzed 69 reviews of Delonghi ECAM 22.113 B. The average rating for this product is 4.6/5, compared to an average rating of 4.4/5 for other products in the same category for all reviews. People are impressed by the design and price, whereas there are some critical opinions about the size. We analyzed user and expert ratings, product age and more factors. Compared to other products in the same category the Delonghi ECAM 22.113 B is awarded an overall alaScore™ of 88/100 = Very good quality. The machine does everything for you, it's easier than preparing an instant coffee but much tastier and the aroma is devine. You can also prepare tea as the Cappuccino nozzle produces hot water as well. The end product is not has hot as though you'd used a kettle but you can increase the temperature. It won't let you increase too much as they say you will ruin the coffee? Beautiful fresh coffee at the push of a button. What's not to like? The ability to alter the temperature of the coffee and the creme is a bonus. We bought this half price in the sale I wouldn't have paid the full price. The infuser is difficult to remove and clean. The instructions are not user friendly. Really easy to use, it's as convenient as instant coffee but tastes so much better. Works well once you read the manual properly!